In the world of quip communication and information abundance, f=”http://Fiverr.com” target=”_blank” rel=”nofollow”>Fiverr.com has found a way to maximize your cash. Users of Fiverr can post services to the world where for a not-to-shabby $5 you can get everything from motivational words, website help and even lyrics to a song. Choosing to play, errr…make money, is easy. Set up an account and create a service you think may be worth$5. Of course, you can create a high value item such as “being a personal assistant for 1 hour” and “recording a voice-over message for phone service” or you can offer something fun like “sing Happy Birthday in Hebrew to anyone”. It”s obvious I believe this to be a great idea and will follow this to the fullest. What do you think about adding $5 jobs to the marketplace? Can someone make a living off this type of micro-commerce? I think its a novel addition to the realm of fast communication and as the dust settle this could easily become the niche market for the mundane task we deal with everyday. I mean, who REALLY wants to take the time to write a resume when some someone would do it for $5. Get ready for a micro-economic shift. 140 characters last year, 500 pennies today. Here are some “important” bullet points from Fiverr.com your should know first. 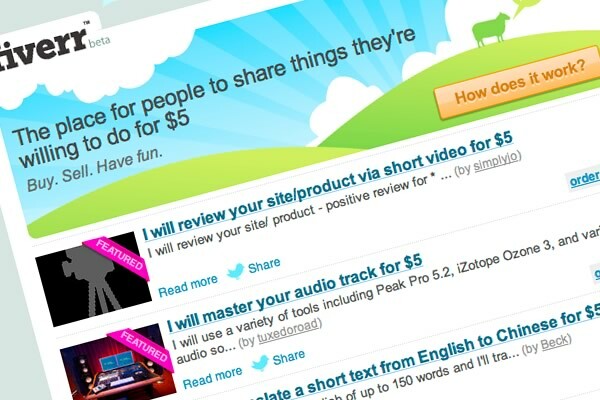 You need to be a Registered Fiverr user to sell and buy. Registration is free. Services that are offered by sellers on Fiverr are called “Gigs”. Gig prices are fixed f=”http://www.atoledo.com/”>atoledo at $5. For each of your gigs that was ordered and delivered, your net share is $4. When buyers order one of your gigs, they will be required to pay for the gig in advance. When a buyer orders one of your gigs, you will be notified and asked to Accept or Reject the order. Rejecting an order should only be used when you will not be able to perform your offering on time. If you are away and cannot handle orders, it is good idea to suspend your gigs from your “My Store” control panel. During your work, you are required to use only Fiverr”s internal mail system to pass material from and to your buyer. Using the Fiverr mail system protects the seller”s and buyer”s privacy. Never ask a buyer to switch to third party email. Purchase of gigs from Fiverr can be done using your PayPal or credit card (credit card purchases are handled by PayPal as well). You can cancel your order at any time until the seller Accepts your order. Once the seller accepts your order you will not be able to cancel it. Sellers have the option to reject an order if they can”t handle it on time. If for any reason your order gets rejected, your $5 will be placed in your Fiverr balance and will be available to you for purchasing other gigs on Fiverr.